2019 T-Shirt Contest for Middle School Students - Save Dallas Water! 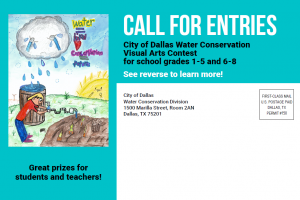 6th -8th Graders Can Enter the 2019 Dallas Water Conservation T-Shirt Contest to Win Valuable Prizes & Recognition! This is an exciting opportunity for students to show their artistic talents, win prizes and to make their school and family proud! WHEN: Artwork and entry form are due by 5:00 p.m. Friday, March 8, 2019. A reception for winners, their teachers and families will be held on May 2019 in recognition of Drinking Water Week May at Dallas City Hall. PRIZES: There will be 1 grand prize winner, and 2 honorable mention winners. THE ENTRY FORM MUST BE SUBMITTED WITH EACH ENTRY! Entries MUST be separated and labeled by category. Artwork must be flat – do not roll or fold. 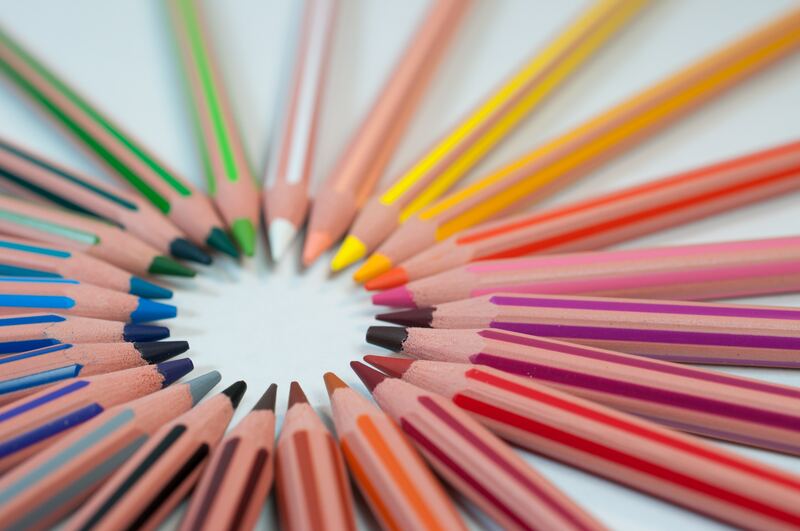 Artwork will be judged on creativity, originality, artistic merit, and adherence to guidelines and criteria. Theme: The water conservation future and message. Originality: Artwork should creatively reflect the idea or concept chosen to illustrate water conservation with as little repetition of pre-existing ideas as possible. Legibility: The artwork is readable and easily understood. Adherence to Guidelines: Entries must follow all guidelines or the submission will be DISQUALIFIED. *Each entry must be the work of one student. The concept, design and artwork must be the original work of the student entering. If the judges determine that someone other than the student has assisted in the creation of the poster, the entry will be disqualified. There will be one Grand Prize winner for each contest and one Honorable Mention winner selected for grades 1 through 8. All winners will also be invited to a reception at Dallas City Hall in May 2019.
will each receive a $50 voucher for school/art supplies. Each entry must be original in concept, design, and execution and may not violate any U.S. copyright laws. Take shorter showers – five minutes or less. Try to save even more by turning the water on to get wet; then turn it off to lather up and finally turning it back on to rinse off. Think about other ways to use water before letting it go down the drain. Perhaps watering a plant or rinsing something that needs cleaning. Avoid water toys that need a constant stream of water. Only run the dishwasher or washing machine when they are full. Watch for leaky faucets and learn how to help your mom or dad fix them. Did you know that it can waste 20 gallons of water a day? Ask your parents to install a water-saving shower head. In addition to the water it saves, it also saves the fuel that would have been used to heat up the extra hot water.That saves your family money and helps reduce pollution. Don’t let the water run when you wash dishes. Remind your parents that grass only needs one inch of water every five to seven days to stay healthy and green. Most people use much more water than is needed and cause their grass to have shallow roots which makes the grass unhealthy. Try to do one thing each day that will save water. Even if savings are small, every drop counts. How can I use water wisely at home or at school? How can saving water help the environment? How can water be used wisely in the industry? If we do not conserve water now, what might happen in the future?